I'm super excited to share this recipe with you guys. Two of my very good friends are dating Irish men so this year I wanted to go all out for my Paddy's Day post. A few years ago I was lucky enough to spend the day in Dublin for St. Patrick's Day with one of those friends. I wish we lived in the same place so I could share these cupcakes with them! I know both of my girlfriends would LOVE these treats. 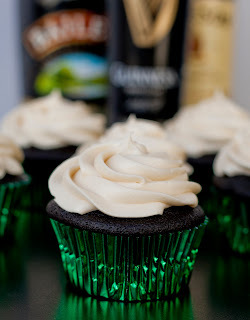 I figure if you're going to make a boozy cupcake, you might as well go all out. 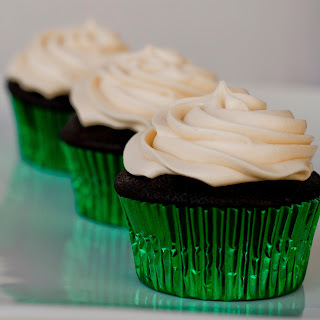 This is a rich, moist, flavorful dark chocolate stout cupcake, stuffed with a whiskey spiked ganache, topped with a tangy, not too sweet baileys cream cheese butter cream frosting. Sounds complicated but it's really not. Each bite hi-lights a different flavor and I love how they come together. Some might call this an Irish Car Bomb cupcake but I prefer 3 Irish Men. There may or may not have been a rough night in college during Whistler weekend that involved one too many Irish Car Bombs. I've never been able to drink one since. These cupcakes on the other hand are a different story! 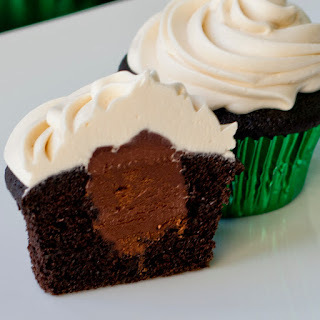 If you're a chocolate lover, this is the cupcake for you. 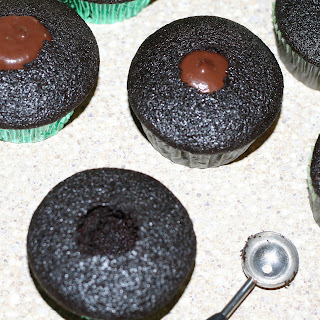 Preheat oven to 350º F. Line your cupcake pan with cupcake papers and set aside. In a large bowl, mix eggs, yogurt, vanilla, and beer together. In a separate bowl, sift together your dry ingredients (flour, sugar, baking soda, powder, cocoa, and salt). The sifting is important because cocoa powder tends to be very lumpy. I just used a fine mesh sieve but use whatever you have on hand. Add half of your dry ingredients into your wet and mix well. Once incorporated, add the remainder of the dry to your wet and stir until well combined. 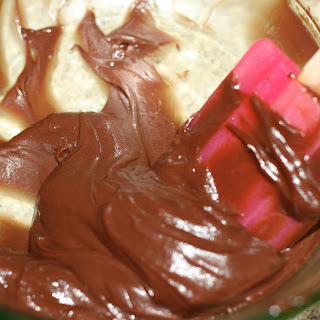 Melt your butter in the microwave and add this to your cupcake batter. Stir one more time until it's fully mixed and you're ready to drop the batter in the tins! I used an ice cream scoop so that each cupcake was uniform in size. Fill the cupcake liners about ¾ of the way full. Bake for about 25 minutes. You'll know the cupcakes are done when a toothpick comes out of the center clean. Let cupcakes cool for about 10 minutes before transferring to a cooling rack. If you get impatient, you might end up with floppy cupcakes. They need time to cool down before you remove them from the tin! While your cupcakes are cooling, get started on your ganache. In a small sauce pan, heat cream over medium heat until it's really warm but not boiling. Chop chocolate into small chunks and place in a medium sized bowl. Add butter in small chunks. Once your cream has warmed up, pour over the chocolate and butter. Stir until it melts and becomes cool. Finally add in your whiskey and set aside to firm up a little bit. While your ganache is cooling, use a small circular cookie cutter (or in my case a melon baller because I didn't have one) and remove a small portion out of the center of each cupcake. If you don't have either of these tools, carefully use a pairing knife and a spoon to remove the center. It doesn't have to be a perfect circle. You're going to fill it with ganache and top it with frosting so no one will know anyway. The ganache should have this consistency to it (still soft but holds it's shape). It will take about 15-20 minutes to cool to this texture. Once all the centers are removed, fill a ziplock bag and cut the tip off or piping bag with the cooled ganache and stuff your cupcakes with the filling. On to the frosting! In a large mixing bowl, cream the butter and cream cheese together until smooth. Slowly add in your powdered sugar about a half a cup at a time. I've found by doing this it helps melt the sugar better and it makes the frosting a lot less grainy! Once all of your sugar is incorporated, add in your baileys. I used a piping bag to frost the cupcakes but you can use any method you like. Ta-da! Super fancy cupcakes for your Paddy's Day celebration! Or any day really, lets be honest! 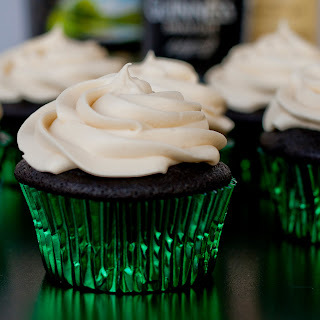 i wanted an authentic irish cupcake to celebrate st. patricks day. you can use any stout beer and whiskey you like for this recipe. you can also leave out the whiskey from the ganache if you don't like it. you can adjust the amount of booze by a TBSP or two less if you want a VERY subtle flavor. however this recipe probably won't take more booze... i packed it with as much flavor as possible. if you don't have sour cream on hand you can use non-fat yogurt or greek yogurt. just make sure it's plain flavored. i know it probably sounds like a weird ingredient for cupcakes but it helps make them really moist, keeps it lower in fat, AND balances out the sweetness. it's the miracle worker of the cupcake! LOVE this Mo!!! What a grand day we spent together in Dublin for that St. Patrick's day....... crazy weekend all around actually! I want to eat one of these NOW! They sound and look so delicious, my mouth is actually watering! I'll definitely be sharing this with Darren, he'll love them! Love you and good work my love! Thanks for sharing, Our Ac Service Phoenix business provide wide range of experience with many different brands of air conditioners as well as one of the best service provider. Fabulous cakes. Shall print this recipie and come St. Patricks Day I will be making these. great nice post . thank for sharing. Nice wrap-up! Your hotel room looks NOTHING like ours. Were you in the tower or the garden? Lovely sweetie cupcake, thanks for how to cooking.